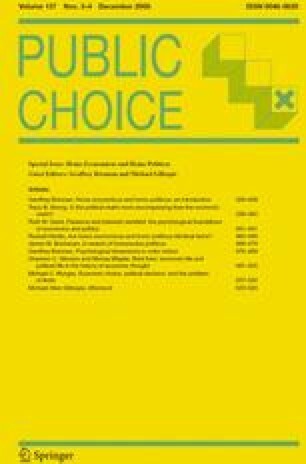 Assesses the arguments for the use of market, or political, processes for making collective choices. The border between “what is mine” and “what is ours” is contested, but it is unguarded. Where should it lie? How would we know when it should be adjusted? I uncover an old paradox: A society can never use political means to guard against incursions across the border for political ends. Some other mechanism, such as constitutional or other extra-statutory rules, are required. Paper Prepared for the Gerst Program in Political And Economic Studies 7th Annual Conference, Homo Politicus and Homo Economicus, April 27–28, 2006. Weingast, B. R. (2005). Self-enforcing constitutions: with an application to democratic stability in America’s first century. (Internet manuscript). Stanford: Department of Political Science. http://polisci.stanford.edu/faculty/documents/weingast-self-enforcing%20constitutions.pdf.